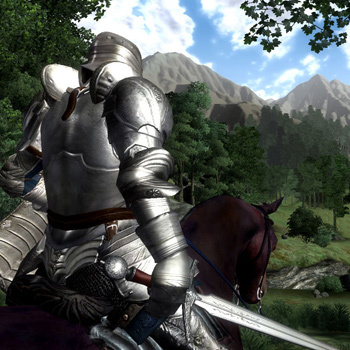 Oblivion is a single-player game that takes place in Tamriel's capital province, Cyrodiil. You are given the task of finding the hidden heir to a throne that sits empty, the previous emperor having been killed by an unknown assassin. With no true Emperor, the gates to Oblivion (the equivalent of hell in the world of Tamriel) open, and demons begin to invade Cyrodiil and attack its people and towns. It's up to you to find the lost heir to the throne and unravel the sinister plot that threatens to destroy all of Tamriel. In keeping with the Elder Scrolls tradition, players have the option to experience the main quest at their own pace, and there are plenty of opportunities to explore the vast world and make your own way. Numerous factions can be joined, such as the thieves or mages guilds, and each contains its own complete storyline and the chance to rise to the head of the faction and reap further rewards. Oblivion features a groundbreaking new AI system, called Radiant AI, which gives non-player characters (NPCs) the ability to make their own choices based on the world around them. They decide where to eat or who to talk to and what they say. They sleep, go to church, and even steal items, all based on their individual characteristics. Full facial animations and lip-synching, combined with full speech for all dialog, allows NPCs to come to life like never before.